Celebrate the 100 year anniversary of RMC and discover the rich history of Duntroon with this superbly designed and crafted full color book. This book is an inspirational record, both past and present of the accomplishments of one of the world's leading officer training establishments. 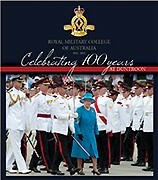 This book captures the evolving traditions of this institution, walks you through a day at Duntroon, provides a spectacular photographic record of the centenary celebrations and offers so much more. This magnificent book is available in both paperback or limited edition boxed hardback.